Taking a look at the LG Pop you wouldn’t think it would be able to handle as much as it can. There is so much that is packed into this little device that it certainly is worth the $19.99 on a 3-year, even the $174.99 prepaid price tag. So what does the Pop look like? The design is pleasing because it’s simple. All plastic makes up the device with overall dimensions of 95.3 x 49.6 x 11.2 mm and weighs a light 89 grams. There are minimal buttons: call/end, power/lock, volume rocker, camera/multi-tasking key. The Pop has a 3-inch touchscreen that has a resolution of 240×300 and when looking at pics/videos they comes up a bit pixelated. 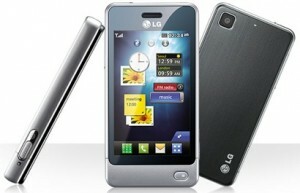 This could also be the fact that it comes loaded with a 3 megapixel camera (can take video). The combination is decent and again good for quick capture to send to friends. The actual touchscreen is responsive. Using the 3 home screens makes the Pop fun. You have your widgets, LiveSquare and quick contacts screen. Flipping between these can be done by swiping across the touchscreen with your fingers. The new LG S-class has been put in and is a nice experience with all your apps and programs organized into either: Communication, Entertainment, Utilities and Settings. Using the QWERTY keypad will take some getting used to. Since the device is incredibly small, so is the keyboard. You’ll see in the video it takes some time to effectively get used to the keys… after a while you’ll be flying by each letter but the initial learning curve will be bit. Using the keyboard was a bit frustrating during our test to send a text message, surfing the web with the toolbar. When it comes to the sound quality of the Pop, at full blast the sound is a bit muffled but if you take it down a few notches it comes in perfectly clear. The good news about the Pop is that it can pack in up to 16GB with a microSD card – more than enough space for all your pics/vids. Other quick goodness about the Pop is that it has an FM Radio, Bluetooth, speakerphone.